In Part 2 of her talk titled “From Atlantis to Orion’s Belt”, Trish Mills continued her research into what was the purpose - or purposes plural - of all the astronomically aligned edifices built by early man, and why the pyramids, Stonehenge, Avebury and Newgrange, and all the other myriad monoliths and mysterious mounds, were astronomically aligned with such stunning accuracy? Having investigated in Part 1 the energies that seemed to increase crop yield and resistance to pests and diseases in seed that had been exposed to these energies, in Part 2 Trish suggested another purpose might actually have been that these were early man’s observatories for tracking the sun and the moon, the planets, the stars and constellations as accurately as possible. She gave a brief history of astrology through the ages, claiming that it was the oldest science in the world, and the mother of astronomy. The difference between these two types of knowledge has been described as the difference between insight and mere technical information. She went on to describe how the sun’s energy changes throughout the year, with twelve ‘bands’ of 30 degrees, which made up 360 degrees, which made up a circle, which made up the year. We call this the Zodiac, which the Babylonians figured out in 700 B.C. This explains the sun signs as we know them today, and also, it has been shown that there are four different types of solar energy, which make up the element signs - Earth, Air, Water and Fire. The effects of Sun spots or flares of plasma - superheated gas - affect us here on earth, and our radio and TV signals as well, which is tangible evidence. Meteorologists are gradually becoming more aware of the effect distant planets have on terrestrial weather, and have produced statistics to show that the moon influences rainfall; Mercury influences temperature; and in a study of 134 earthquakes, it was found that the position of the planet Uranus was significant. We already accept that the moon controls the tides, and influences the female menstrual cycle, the sowing of seeds, plant growth, bird migration, the exact moment when butterflies and moths emerge from the chrysalis, which way an earthworm turns when it leaves its hole in the soil, and our mental state (as in lunacy), so how can we possibly deny that the sun and other planets affect us too? Trish then went on to describe some of the ancient religions, and how they often imported parts of other religions, notably Christianity adopting many of the Pagan festivals, such as Easter, which we associate even today with eggs and chickens and gambolling lambs - fertility, fertility and fertility. And at Christmas, we have Yule logs, holly, ivy, and mistletoe . . . all purloined from the Pagan religion. We were then introduced to Osiris, an Egyptian god. 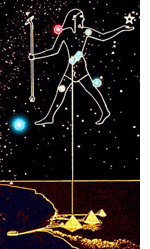 One of the remarkable things about Osiris, said Trish, is that he is strongly linked with the constellation of Orion. Not only are the three best-known pyramids of Giza built in the same configuration as the three brightest stars in Orion’s belt; but also, the King’s Chamber in the Great Pyramid has shafts aligned on Orion; and the shafts in the Queen’s Chamber are focused on Sirius, the dog star, which enters the heavens each year just before Orion appears. So Sirius’ annual appearance in the skies told the Ancient Egyptians that Orion was coming, and Orion told them the most important event of their year was approaching, the flooding of the Nile, which was the only thing that made living in the desert possible. Which begs the question – did early man, and the early astrologers – did they already know right from the start that we are a product of star dust? And does that explain their obsession with astrology, with Orion’s belt and Sirius, and all the other stars and constellations? Was that one of the reasons they built all those monoliths and mounds . 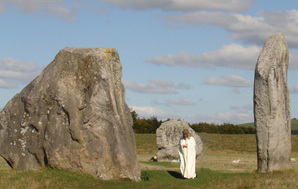 . . the Pyramids; Avebury; Stonehenge; Newgrange . . . as observatories? And were they simply trying to figure out a way of getting back to heaven when we die?